John Wallis played an important role in the scientific revolution of the 1600s. Starting his working life as a clergyman, his abilities as a problem solver and amateur mathematician drew him into academia. 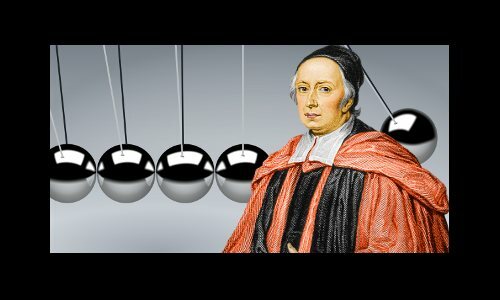 Wallis, a polymath born one generation before Isaac Newton, discovered the concept of conservation of momentum, one of physics’ most indispensable concepts. He was also one of a small number of mathematicians responsible for developing infinitesimal calculus and was the first person to make use of the now familiar number line with both positive and negative numbers. In Wallis’s time, most mathematicians saw algebra as inferior to geometry because it lacked the solid foundations of Euclid’s proofs. Wallis, however, championed algebra as a means of generating new ideas and results. Unlike Newton, he was happy to publish results in algebraic form. Wallis introduced the now familiar mathematical symbol for infinity: ∞, and was an acclaimed code breaker, serving as the government’s chief cryptographer for 46 years. Discovered the concept of momentum conservation. Championed the use of algebra in mathematics. Played a significant role in the development of infinitesimal calculus. Introduced a number line with positive and negative numbers. 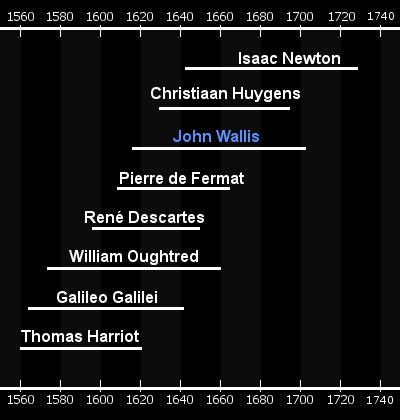 John Wallis’s lifetime and the lifetimes of related scientists and mathematicians. John Wallis was born on November 23, 1616 in the market-town of Ashford, Kent, England. His father was the Reverend John Wallis, a church minister. His mother was Joanna Chapman. John had two older sisters and two younger brothers. He was six when his father died. John began school in his hometown, learning English and Latin. In 1625, there was a plague outbreak in London that killed over forty thousand people. The outbreak spread to Ashford. Plague was incurable, deadly, and struck with such virulence that victims could wake up in the morning, apparently healthy, and be dead before the day ended. Steering clear of plague-struck areas was the best way to stay alive. John’s mother moved her nine-year-old son eight miles (13 km) to James Movat’s small, private grammar school in Tenterden, Kent. At James Movat’s school, John’s exceptional academic gifts became evident. He sought to understand things from first principles rather than simply memorizing facts. In December 1630, age 14, John moved 90 miles to Martin Holbeach’s school in Felsted, Essex. There he learned Logic and became accomplished in Latin and Greek – Latin was the school’s everyday language. He also learned some Hebrew. These languages were required for university. He learned no mathematics, but during the Christmas vacation his younger brother Henry showed him some arithmetic he had been learning. John was fascinated by the subject and began studying it independently for pleasure. A year after his first brush with arithmetic, he became an undergraduate at the University of Cambridge’s Emmanuel College. There his favorite subject was Logic, especially syllogism – i.e. reasoning by deduction. He was awarded a bachelor’s degree in 1637 and a master’s degree in 1640. These were general arts degrees with minimal formal mathematics. Wallis did, however, take an Astronomy course. In 1640, age 23, Wallis was ordained by the Church of England. In the following years, he worked as a chaplain in Yorkshire, Essex, and London. In 1642, the English Civil War began. Wallis’s religious beliefs favored Puritanism and he supported Parliament against the King. He was shown an encrypted message and said he would attempt to decipher it. He quickly recognized it as a simple alphabet substitution code and wrote the message in clear English within two hours. The following year, he was appointed Parliament’s chief cryptographer, a post he held for 46 years. Parliament won the war and England became a republic in 1649. In 1660, Parliament decided to restore the monarchy. Wallis became chief cryptographer to the royal court. The court favored him because, although he sided with Parliament in the civil war, when the war ended he had publicly opposed the execution of King Charles I.
Wallis’s mother died in 1643. He inherited a large country estate along with a significant sum of money. Wealthy at 27, he could have retired, but his mind sought more stimulation than life in the country offered. In 1645, Wallis married and moved to London. There he became friendly with other men who were interested in natural philosophy. They began meeting once a week to discuss progress in medicine, mathematics, astronomy, physics, and chemistry. These meetings ultimately led to the foundation, in 1663, of the Royal Society, the world’s first national scientific institution. In 1647, age 30, Wallis’s life changed when he read William Oughtred’s highly influential algebra textbook Clavis Mathematicae, considered the best in Europe. Oughtred taught algebra succinctly and expertly, introducing the multiplication sign × and the proportional sign ∷. Wallis feasted on the book’s contents for two weeks and started a lifelong mathematical correspondence with Oughtred. In 1649, Wallis was appointed Savile Professor of Geometry at the University of Oxford, a position he held for 54 years until his death. 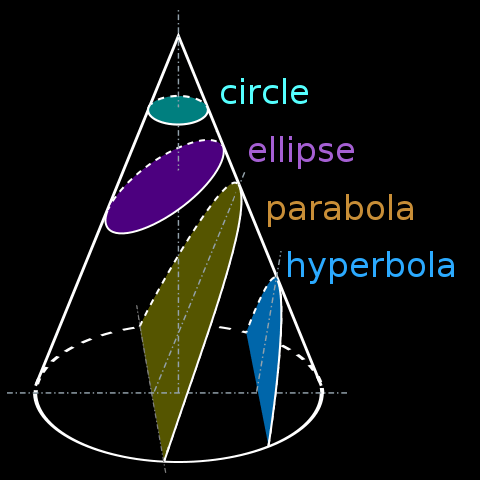 The ancient Greeks discovered that slicing a cone creates interesting 2D shapes: the hyperbola, the ellipse, and the parabola – the circle is a special case of the ellipse. The conic sections. Originally mathematical curiosities, these shapes define the paths followed by bodies acting under the influence of gravity. In 1656, in De sectionibus conicis – The Conic Sections, Wallis published his discovery of algebraic formulas for the parabola, ellipse, and hyperbola. This was a significant advance on the groundbreaking work of René Descartes, who showed geometrical lines and shapes could be translated into algebraic formulas in La Gèomètrie in 1637. Wallis’s purpose in liberating the conic sections from the cone was his search for a general method to calculate areas enclosed by curves. He discussed this method in Arithmetica Infinitorum, also published in 1656. Wallis’s Arithmetica Infinitorum – Infinitesmial Arithmetic, published in 1656, was his greatest mathematical work. Building on work by Bonaventura Cavalieri and publicized by Evangelista Torricelli, Wallis produced a method to sum infinitesimal quantities and determine the area enclosed by curves. His mathematical style was laborious rather than inspired, but Wallis’s Arithmetica Infinitorum was a vital stage in the development of integral calculus, and highly influential. Wallis focused on the issue of summing sequences of powers or finding the ratio of these sums to known quantities. In 1665, at age 22, Isaac Newton generalized Wallis’s work to make his first great discovery: the generalized binomial theorem. Newton’s copy of Arithmetica Infinitorum, with his own comments in the margins, still exists. This was only the second time π had been expressed as an infinite product. François Viéte achieved the first instance in 1593. The individual terms in Viéte’s formula featured sums of square roots within square roots. In 1668, the Royal Society issued a challenge to scientists and mathematicians to produce a robust theory accounting for the behavior of colliding bodies. Christiaan Huygens, Christopher Wren, and Wallis submitted correct solutions involving the conservation of momentum in elastic collisions – i.e. collisions in which there is no loss of kinetic energy. Only Wallis extended the theory to cover inelastic collisions. 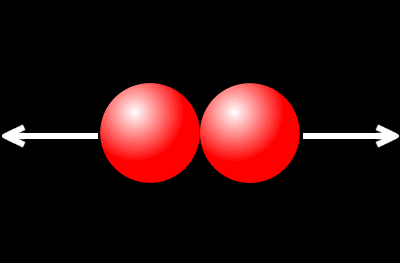 An elastic collision: atoms collide with no loss of kinetic energy. Momentum is conserved. 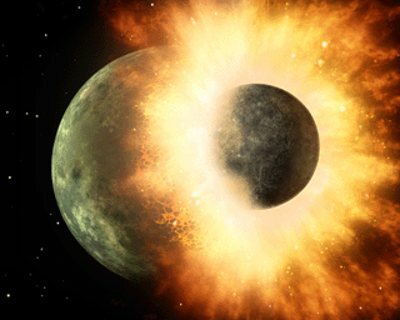 An inelastic collision: planet-sized bodies collide with kinetic energy lost to heat. Momentum is conserved. In 1669, 1670, and 1671 Wallis published in three parts Mechanica sive De Motu, Tractatus Geometricus – The Geometrical Treatment of the Mechanics of Motion, correctly describing momentum conservation in collisions. In the 1600s, scientific norms had not been established and claims of plagiarism – such as Newton’s accusations against Leibniz regarding calculus – were common. Wallis became involved in a number of feuds, for example with his fellow Oxford scholar Thomas Hobbes, who claimed to have found a method to square the circle. To Hobbes’s fury, Wallis – a better mathematician by far – refuted his claims. The ensuing feud ended only with Hobbes’s death 24 years later. In later life, Wallis seems to have taken an increasingly dim view of the claims of continental European mathematicians. He became a staunch defender of English science, believing its intellectuals were fundamentally modest while many from the continent were egotistical exhibitionists. He saw himself as a patriot and refused requests from Gottfried Leibniz to divulge his cryptography methods. In 1653, Wallis published Grammatica Linguae Anglicanae – English Language Grammar – a very popular work, with several updated editions issued within his lifetime. The book set the mold for English grammar in the 1700s. Wallis seems to have had a remarkable dexterity with numbers and calculations. If he could not sleep, he would pass the night with mental calculations. In one wakeful night he found the square root of a number to 53 places, quoting the result correctly to 27 places the following morning. In March 1645, at age 28, Wallis married Susanna Glyde. Several of their children died in infancy. The children who survived to adulthood were their son John, who became a lawyer and Member of Parliament; and their daughters Anne and Elizabeth, both of whom married prosperous husbands. Susanna died on March 17, 1687, after 42 years of marriage. John Wallis died, age 86, in Oxford on November 8, 1703. He was buried at the University Church of St Mary the Virgin in Oxford. He was survived by his three children and his grandchildren. "John Wallis." Famous Scientists. famousscientists.org. 30 Apr. 2018. Web. Image of Wallis courtesy of Wellcome Images and Famous Scientists licensed under the Creative Commons Attribution 4.0 International license. Image of conic sections courtesy of Magister Mathematicae under the Creative Commons Attribution-Share Alike 3.0 Unported license.